Leading children from exploitation to education since 1998. It was on January 17, 1998 when Honorary President of Global March and Nobel Peace Laureate (2014), Kailash Satyarthi embarked upon a journey with one determination- to end child labour and garner attention from all corners of the world on this mammoth task. It was at a time when no one accepted child labour to be a social menace- a time when children had no voice and their lives were only governed by the whims and fancies of insensitive adults, who shamingly exploited children with no fear of being punished or reprimanded. Children thus as always continued to suffer under the slavery of their masters- sometimes under the veil of domestic households, sometimes in factories or farms or sometimes in restaurants or roadside. However, it was in 1998 Mr. Satyarthi took it in his stride to make the world aware that child labour was no more acceptable and the world must come together to take strong action to put an end to this exploitation and abuse. More than 7 million people including children, former child labourers, child rights organisations, trade unions, teachers’ associations and concerned citizens from all across the globe joined Mr. Satyarthi and marched for 80,000km with only one voice- “From Exploitation to Education... Let’s Stop Child Labour”. This March culminated on June 1, 1998 in Geneva where a concrete demand for the formation and adoption of ILO Convention on Worst Forms of Child Labour was made. 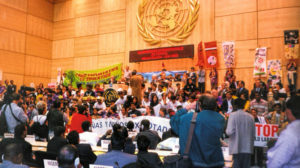 The marchers were openly welcomed at the ILO and the Convention 182 was formally adopted in June 1999 and went on to becoming the fastest ratified Convention in the history of ILO. Since then Global March never looked back and became the largest civil society network, with partners in more than 140 countries, committed to mobilising global efforts to protect and promote the rights of all children, especially the right to receive a free, meaningful education and to be free from economic exploitation and from performing any work that is likely to damage the child’s development. Today- January 17, 2017 marks the 19th Anniversary of the historic ‘Global March against Child Labour‘ and the birth day of the loudest voice of the most marginalised children of the world- a day that is worth celebrating. In the last 19 years we have achieved a lot and made some remarkable achievements. From founding a strong global movement to end child labour mobilising 2000 institutional partners in over 140 countries, to drawing world’s attention to domestic child labour and slavery through repeated campaigns; from organising the first ever International Conference on Child Labour in Agriculture to leading some of the most influential campaigns on child labour in Sports and Chocolate industry; from initiating a group of ‘Parliamentarians Without Borders for Children’s Rights’ to advocating and successfully getting the term ‘slavery’ included in the Sustainable Development Goals. Today we are proud to say that we have left no stone unturned to bring justice to the exploited children of the world and have done all to protect and promote the right of every child to be free and educated. Through our multi-disciplinary approach, acknowledging that most of the problems that we address- child labour, slavery, trafficking, education and poverty- are complex and interlinked, we have been able to heavily focus on developing knowledge, research and policy innovations. This approach has led to the formation of the world’s first ‘Global Task Force on Child Labour and Education’, an inter-agency collaboration by UNESCO, UNICEF, UNDP, The World Bank, Education International and Global March, to find increasing links between education and child labour and promote children’s fundamental rights. But all this wouldn’t have been possible without partnerships and support from kind individuals, foundations, governments, institutions and national and international agencies that believed in our cause and became catalysts of change for making this world a better place for children. This history of Global March is more than a story of a wild determination of one man who inspired millions to do their bit for the most vulnerable children, to its becoming one of the world’s leading international development organisations in the world. It is a story of millions of people- in thousands of communities around the world, who are working day in and day out to end child labour and bring education to all. It is a story of children- given the chance to lead meaningful lives with their right to lead a life of dignity- a chance that inspired thousands of other children to realise their rights and lead many more on the path of a happy childhood and a secure future. This New Year, we again look forward to your continued support and commitment for our cause, as we work to ensure that the coming years offer even more positive change and opportunities for children to develop themselves to their highest potential and become inspiring leaders of tomorrow, a tomorrow that is free from child labour and all forms of exploitation of children. We are doing our bit. Are you?